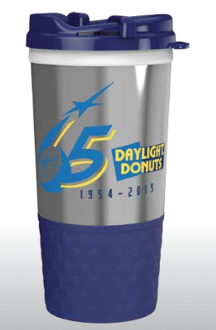 This 16oz double-wall insulated travel mug features a rubber easy-to-grip base that fits snugly inside all cup holders. The flip-top lid can be opened or closed easily with one hand while on the move and snaps into place to prevent spills. Dishwasher and microwave safe.